Kennedy, Jacqueline. Jacqueline Kennedy: Historic Conversations on Life with John F. Kennedy (2011). Hyperion Books. আইএসবিএন ১৪০১৩২৪২৫৮. The U.S. 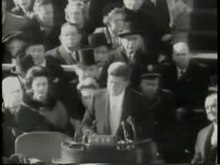 Senator John F. Kennedy Story an early film made for his 1958 reelection campaign by his then-press secretary Bob Thompson.